Being named the best in the nation? That’s a great day on its own. 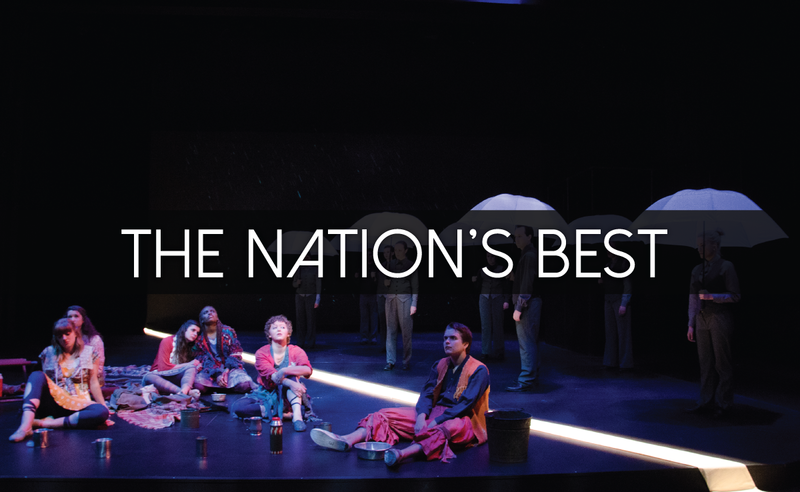 Receiving multiple honors that affirm a distinctive quality of the college’s Department of Theatre and celebrate the efforts of students and alumni together? It doesn’t get any better. Every theatre production is a team effort, but The Line Between was doubly so, since it was not only presented by a Hope cast and crew, but written by students and two of the department’s graduates as a devised-theatre learning experience. The department’s tradition of engaging students in devised work began with the nationally recognized production of Rose and the Rime, which was invited to the January 2008 regional festival and then to be presented as a full production at the Kennedy Center in April 2008. The national festival adopted its current method of recognizing productions, instead of inviting them to be performed, in 2012. The students developed The Line Between collaboratively with Daniel Kwiatkowski ’04 and Erik Saxvik ’04, who are theatre professionals in New York City, during the 2016-17 school year, and the play premiered at the college in April 2017. Kwiatkowski and Saxvik co-directed and share the national directing recognition. Individual students also received recognition through the national festival, with four who garnered regional honors themselves among only 125 students from across the country invited to attend. Akia Nyrie Smith ’18 won the Dell’Arte International School of Physical Theatre Summer Intensive Scholarship, for a residential program which ran June 25 through July 13, while participating in the national Irene Ryan Scholarship auditions with her scene partner, Sam Hill ’18; senior Rachel Dion participated in the Aspire Arts Leadership Fellows Program; and junior Emmie Sandstedt participated in the stage management program. The Line Between follows the hero’s journey through two worlds: a clean and crisp community, and a band of wild, expressive nomads. With a clear boundary between them, the play discovers what it means to see the world from someone else’s point of view. With a bond of sisters, family and friendship, The Line Between explores the hope of humanity and the power of forgiveness.